Em Riem’s latest exhibition, Nature II, opens at Design la Galerie, #13D, St 178 tonight, Tuesday 25 at 6.30 pm. At Meta House on Thursday 27 at 7 pm, a Montreal based independent media art centre, Videographe, is presenting works drawn from their catalogue, ranging from highly experimental video art to social documentaries, including the latest work of Cambodian-Canadian filmmaker Paul Tom, A Country of Silence. Check out the over 1600 videos available on-line via its webplatform www.vitheque.com. From Friday 28 through to Sunday 30 the third annual Chaktomuk Short Film Festival takes place at venues across Phnom Penh: Platinum Cineplex, Legend Cinema, Bophana Center, Meta House and Diamond Island. Find out more on the official website and watch the trailer here. At Raffles Le Royale on Sunday 30 afternoon, a special charity auction organised by ReCreation Art Agency and hosted by auction house Christie’s. Following the event, there will be performances by Amrita Performing Arts: Khmeropedies III (excerpt) by Emmanuèle Phuon; Bach Cello Suites by Chumvan Sodhachivy; and Ferocious Compassion by Peter Chin. A ticketed event: available at Amrita Performing Arts office (128 G9 Sothearos Boulevard), K-West (Riverside), Institut Francais bookshop, Raffles Hotel Le Royal gift shop, Mango on Sihanouk Boulevard. Auction start 3 pm, performance starts 6pm. Poets: get to it. Kosal Khiev challenges writers, poets, lyricist, rappers, friends to write him a poem to send him home. We missed the opening last week, but Bo Rithy’s second solo exhibition, Longvaek’s Bamboo, opened on Friday at Romeet Gallery. The show, an installation in bamboo, runs through until 21 April. Tuesday 25 at 6.30 pm, Em Riem’s latest exhibition, Nature II, opens at Design la Galerie, #13D, St 178. More info Even more infoFriday 28 through to Sunday 30 the third annual Chaktomuk Short Film Festival takes place at venues across Phnom Penh: Platinum Cineplex, Legend Cinema, Bophana Center, Meta House and Diamond Island. Find more on the official website and watch the trailer here. More infoSunday 30 from 3.30 pm at Raffles Le Royale, a special charity auction organised by ReCreation Art Agency, followed at 6 pm by performances Amrita Performing Arts: Khmeropedies III (excerpt) by Emmanuèle Phuon; Bach Cello Suites by Chumvan Sodhachivy; and Ferocious Compassion by Peter Chin. 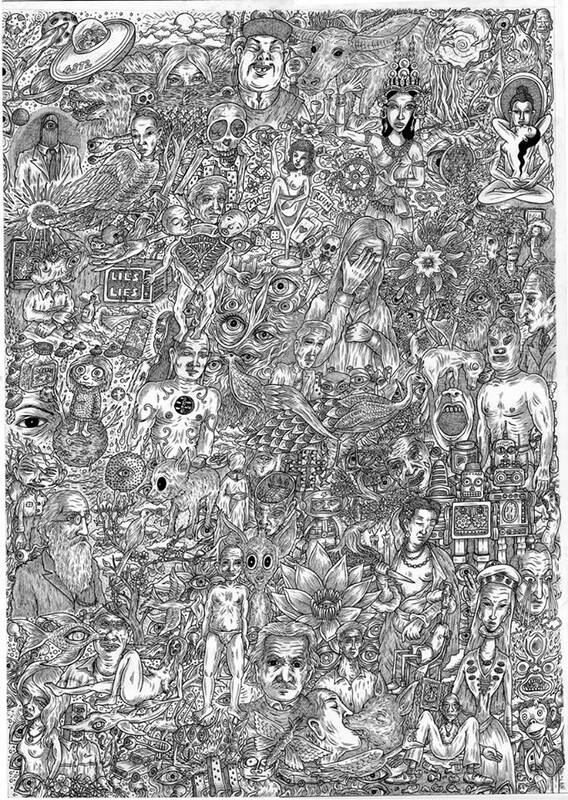 Java Cafe presents Horror Vacui: The Interior World, installation and drawings by Nicolas C Grey. Until May 18. Bo Rithy’s second solo exhibition, Longvaek’s Bamboo, at Romeet Gallery. The show, an installation in bamboo, runs through until April 21. Meta House, PPPORTRAITS by Spanish photographer Albers, featuring snapshots from around Phnom Penh. Meta House hosts an exhibition of The River and Surf Paintings as part of the The White Canvas Series – a series of interdisciplinary installation works by Jan Krogsgaard and Liam Morgan. Chinese House presents The Skin Code: photographer Mona Simon and writer Cova Alvarez explore the lives and journeys of a mixture of Cambodian and foreign women. The quiet half of the sky, a series of paintings by Chhan Dina: “the surface reality of the daily work of Cambodian women, and draws up unexpressed dreams and aspirations from the souls of these mothers, sisters and daughters. […] These eleven strong pieces remind us of the people that we see, that we know, and that we are.” Equinox (St 278, near Wat Lanka). Until April 5. Also on Wednesday 19, Meta House (Sothearos Blvd between Sihanouk and St 294) hosts the opening of an exhibition, PPPORTRAITS by Spanish photographer Albers, featuring snapshots from around Phnom Penh. From 6 pm. On Thursday 20, the monthly Java Café poetry evening returns, featuring readings from Sue Guiney and Bryan Humphrey, a writers’ meet up, and an open mic. Hosted by expat about town Greg Bem. From 6 pm. Also on Thursday 20, Meta House hosts a special screening of Davy Chou’s documentary on Khmer cinema, Golden Slumbers, in the presence of the director. Davy Chou will also screen a surprise short film and hold a Q&A afterwards. From 7 pm. On Friday 21, Meta House hosts the Phnom Penh launch of Sue Guiney’s latest Cambodian novel, Out of the Ruins, with special readings by students from her creative writing workshop at Anjali House, Siem Reap, now in its fourth year. From 6 pm. Also on Friday 21 Romeet Gallery has a new exhibition opening, with details to be made available later in the week. It’s a Cine Saturday double header this weekend at Bophana Center (St 200, btw St 63 and Monivong) on Saturday 22, starting 2pm. Film maker Davy Chou screens Alfred Hitchcock’s Vertigo and leads a debate afterwards. Followed at 5 pm by a celebration of the International Day of the Francophonie 2014 with the screening of three short- films featuring the strong ties between France and Cambodia. Also being celebrated on Saturday 22 is World Water Day, which is being marked in Siem Reap by Italian NGO Through Waters with a guided tour of their travelling photo exhibition at Krousar Thmey, a conference on The water in Angkor by Mr. Peou Hang, of the Apsara Authority, crowned by a special traditional Khmer dancing and music show on a water theme, presented by TLAITNO. Direct contact through artwatereness@gmail.com. And finally, on Sunday 23, the annual FilmCamp Cambodia organised by Kon Khmer Kuon Khmer is being held at Pannassatra University, with registration from 8 am. On-line pre-registration is encouraged, and may win you prizes. Wednesday 19 from 6.30 pm at Java Cafe, Horror Vacui: The Interior World, installation and drawings by Nicolas C Grey. More info Even more infoWednesday 19 from 6 pm at Meta House the opening of an exhibition, PPPORTRAITS by Spanish photographer Albers, featuring snapshots from around Phnom Penh. More infoThursday 20 from 6 pm at Java Café poetry evening returns, featuring readings from Sue Guiney and Bryan Humphrey, a writers’ meet up, and an open mic. More info Even more info Thursday 20 from 7 pm at Meta House hosts a special screening of Davy Chou’s documentary on Khmer cinema, Golden Slumbers, in the presence of the director with a surprise short film and hold a Q&A afterwards. Friday 21 from 6 pm at Meta House, the Phnom Penh launch of Sue Guiney’s latest Cambodian novel, Out of the Ruins, with special readings by students from her creative writing workshop at Anjali House, Siem Reap. Saturday 22 from 2 pm at Bophana Center, film maker Davy Chou screens Alfred Hitchcock’s Vertigo and leads a debate afterwards. Followed at 5 pm by a celebration of the International Day of the Francophonie 2014 with the screening of three short- films featuring the strong ties between France and Cambodia. Saturday 22 from 2 pm, celebration of World Water Day in Siem Reap by Italian NGO Through Waters. Direct contact through artwatereness@gmail.com. Sunday 23 from 8 am, the annual FilmCamp Cambodia organised by Kon Khmer Kuon Khmer is being held at Pannassatra University. On-line pre-registration is encouraged. A late start to the Kumnooh week on Friday 14 at 9.30 pm at Meta House, with a most intriguing sounding electronic music event featuring Berlin-based C-DRIK aka Kirdec, inspired by alternative and experimental music from Africa and Asia. The performance mixes field recordings with electronic sounds and drones in what C-DRIK calls “Cinema for the Ears”. More infoBophana Center’s regular Cine Saturday presents selections from the collection, free of charge. This week, Saturday 15, two recent short student films are offered: Define Love and Crush and Last Second, each followed by Q&A. From 5 pm. Live theatre is presented this weekend on Saturday 15 (7 pm) and Sunday 16 (5 pm) at the Department of Performing Arts (St 173, behind Parkway Centre), two one act comedies by Eugene Labiche: Les suites d’un premier lit and Mon Ismenie. Tickets ($8) for sale at KWEST Restaurant and Carnets d’Asie bookstore. On Sunday 16, at Koh Pich, the album launch for the groundbreaking first season of Songkites, the development programme for young Cambodian songwriters that produced a spectacular night of performances at Doors last year. See them do it all again, and purchase a CD from 6 pm. Also on Sunday 16 at 6 pm, Meta House hosts the opening of an exhibition of The River and Surf Paintings as part of the The White Canvas Series – a series of interdisciplinary installation works by Jan Krogsgaard and Liam Morgan, consisting of white framed canvases on frames, video and photography. Need to get frocked up to attend any or all the above? The History of Things to Come vintage fashion sale returns to Phnom Penh this week, from Thursday 13 to Monday 17. Alternatively, you could learn to put some clothes together yourself at Phnom Penh Community College this weekend with an introduction to using a sewing machine, Sunday 16 from 9 am. Bookings essential. Finally, Java Arts is encouraging young Cambodian artists to apply for the Future Generation Art Prize, run by the Victor Pinchuk Foundation, open internationally to artists under 35. Applications are open until April 12. Friday 14, 9.30 pm at Meta House, electronic music by Berlin based C-DRIK aka Kirdec, inspired by alternative and experimental music from Africa and Asia. More infoSaturday 15, 5 pm at Bophana Center, Cine Saturday presents two recent short student films: Define Love and Crush and Last Second, each followed by Q&A. More infoSaturday 15 (7 pm) and Sunday 16 (5 pm) at the Department of Performing Arts (St 173, behind Parkway Centre), two one act comedies by Eugene Labiche: Les suites d’un premier lit and Mon Ismenie. Tickets ($8) for sale at KWEST Restaurant and Carnets d’Asie bookstore.Sunday 16 from 6 pm, at Koh Pich, the Songkites album launch featuring young Cambodian songwriters. Sunday 16 at 6 pm, Meta House hosts the opening of an exhibition of The River and Surf Paintings as part of the The White Canvas Series – a series of interdisciplinary installation works by Jan Krogsgaard and Liam Morgan. In Battambang, Lotus Gallery, on St 2.5, presents the The darkness of the countryside, an exhibition by Battambang artists Nget Chanpenh and Hour Seyha. Runs until March. Made in Battambang at the Institut français du Cambodge, featuring 113 works by 26 artists. Until March 15. In Siem Reap, Fading Faces at The 1961: a dual exhibition by Kakkada Chhai and Phok Sopheap. A good friend is hard to find, an exhibition of paintings by the late Svay Ken at Meta House. At Meta House tonight, Tuesday 4, at 7pm, a performance of How to Talk to Dragons, by the Neak Allstars, a participatory art project brought together by German artists Ernst Altmann and Bjela Proßowsky, the culmination of six weeks worth of collaboration with local artists, tailors, shadow puppeteers, and musicians. The play will be performed in Khmer, a summary in English will be supplied. Tonight Tuesday 4 in Siem Reap it’s the fortnightly Spoken Arts night, at the Siem Reap Party House from 8.30 pm. Perform! Or just be there. At Java Café on Thursday 6 from 6.30 pm, a special evening presented by Amrita Performing Arts: Monkeys, Boxers and Apsaras: in search of Contemporary Dance, a conversation with choreographer Emmanuèle Phuon and dancers from Amrita Performing Arts, examining past collaborations and current works in developing contemporary Cambodian dance. Begins with a happy hour on the terrace upstairs from 5 pm. Free entrance. And should you be inspired to get your own dance on, regular dance classes for children and adults are commencing this week at the Phnom Penh International Institute of Arts on Tuesday afternoons and evenings. To celebrate Cambodia’s national cultural day Cambodian Living Arts are giving away 30 free tickets every day this week (until Saturday) to the daily Plae Pakaa performances at the National Museum of Phnom Penh. Pick up free tickets at the CLA office (128-G9 Sothearos Blvd) 8am-12pm or 2-5:30pm – 2 tickets per person maximum. Tuesday 4 at 7 pm, at Meta House, How to Talk to Dragons, by the Neak Allstars, a participatory art project. The play will be performed in Khmer, a summary in English will be supplied. Tuesday 4, from 8.30 pm, it’s Spoken Arts night, at the Siem Reap Party House. Thursday 6 from 6.30 pm at Java Cafe, a special evening presented by Amrita Performing Arts: Monkeys, Boxers and Apsaras: in search of Contemporary Dance, a conversation with choreographer Emmanuèle Phuon and dancers from Amrita Performing Arts, examining past collaborations and current works in developing contemporary Cambodian dance. Begins with a happy hour on the terrace upstairs from 5 pm. Free entrance. Chinese House presents the opening of El Campo by Martin Bandzak, a photographic journey into the lives of the Subtiava community in Nicaragua.